John Snitch (Snytch) 1666, was a Carpenter and Overseer of the Poor for Potton. Overseers were chosen from prominent men in the town, usually of yeoman or master craftsmen class and above. Two served at any one time and their period of office lasted one year. It was the job of the overseer to collect the Poor Rate and to distribute it to the needy. John left the sum of £100 plus a cottage and land in his will which made him a rich man, leaving nearly half of his wealth to the poor. John went down in the history of Potton, his memory being kept alive as young apprentices were sponsored under the terms of his will for the next couple of hundred years. In 1699, the money brought "Harvey's Lands" and the profits were used in the way he wanted until 1877. 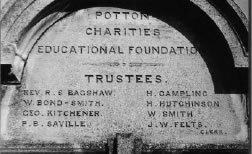 His charity is still there today, integrated in to The Potton Consolidated Charity. He was buried in a prominent position in Potton church graveyard and his grave stone can be seen to this day. The wording on his gravestone say's "Here lieth the Body of John Snitch who departed this life June ye 12 1687. He gave one Hundred Pounds the Interest of which is to put out Poor Children Apprentice (sic) Born in ye Parish of Potton". He is also recorded in the burial register as "1687 June 13 Jn Snitch carpenter who gave an hundred pound to use of the poor of Potton". Painted boards record the charitable generosity of its residents over the centuries. 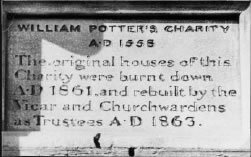 William Potter in September 1558 gave his house in Horslow Street to be let for the benefit of the poor of Potton.Today 4 cottages on the same site still discharge this function. John Snitch various donations and bequests were brought together as Potton Consolidated Charities."